It is well known that the first casualty of war is the truth. In our war against anti-Pakistan terrorists, this also appears to be the case. 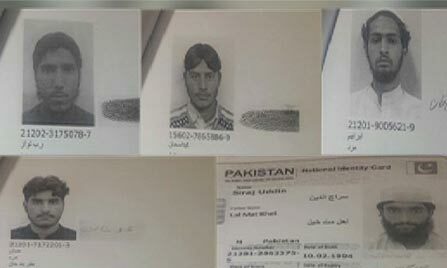 Soon after Badaber attack, it became widely reported that several of the terrorists were identified as Pakistanis. This has caused severe anxiety within the corridors of power, where it is revealed that officials intended to hide the fact that Pakistanis were involved in the attack. Minister for Interior Chaudhry Nisar Ali Khan has expressed anger over making public the profiles of identified terrorists involved in the Badaber Camp attack. According to the Interior Ministry spokesperson, an investigation has been ordered to find out who leaked the profiles, adding that the leak could negatively impact the ongoing investigation, a private television channel reported on Sunday. The Interior Ministry spokesperson stated that terrorists were identified the day the incident took place but this information was withheld on purpose due to the sensitivity of matter. The spokesperson said it appears sharing of information between institutions caused the premature revelation of this information which, the statement said, should never have happened. This is not the only fact that officials have tried to hide. Actually, there appears to be a growing pattern of misleading information coming from up high. In January, Secretary of Defense reported that Chief of Army Staff Gen. Raheel “presented evidence to the United States (US) which shows India’s involvement in the various terrorist incidents that have occurred in Pakistan”. However when asked by reporters about this evidence, the US appeared puzzled and said they were unaware of any delivery. Reports of an extensive dossier on India’s involvement in terrorism feature regularly on our media, even including statements from the highest levels. Yet no one has ever seen any of this evidence. Are the reports only meant to stoke anti-Indian sentiments? Statistics are repeated ad nauseum pointing to a decline in terrorist attacks, and such points must be appreciated. But there are also growing questions about the extent of the success of military operations that everyone is in full agreement about. There is further evidence that in the city of Karachi, militants remain well embedded. On Sunday, a suicide bomber detonated his jacket in the Malir area after police conducted a raid there in search of terrorists. He was apparently one of the persons being sought. Before blowing up his vest, he shot at the police team, injuring two policemen. Police fired back and the weapons used by the wanted man who is believed to be an Al-Qaeda operative have been taken into custody for forensic analysis. This was not the only violent incident of the day. In a separate attack, unknown persons on motorcycles fired at an empty DSNG van belonging to Samaa television channel. No one was injured in the attack, but the message sent out was frightening. Just days before, there had been an attack on a Geo TV DSNG and a senior journalist had been killed in the city at the same time. The same is true for questions about how Badaber attack came to happen. The government and army have responded by air strikes in the Tirah Valley which killed around 16 suspected terrorists. The trouble with these attacks once again is that if the claim is true that the attack on the PAF Badaber base was coordinated from bases in Afghanistan, what intelligence is the basis for the air strikes in the Tirah Valley? Actually, the questions about the official response to Badaber attack bring us back to questions about evidence against India. In this context, it is worth thinking about the DG ISPR’s statement that the assault had been planned in Afghanistan and that terrorists were being controlled from there. Advisor to the Prime Minister on Foreign Affairs Sartaj Aziz has said that Pakistan possesses enough intelligence on cross-border attacks to be shared with Afghanistan, with the government ready to demand concrete action. The issue is that if we had such concrete intelligence already at the start of September, then why was it not shared with Afghan authorities then? Here is the pattern: Officials from government and armed forces announce that Army has broken the terrorists backbone and destroyed their ability to carry out attacks. Then an attack happens. After the attack, foreign countries are blamed and it is claimed that we have fool proof evidence, but this evidence is never shown. At the same time, all evidence about the involvement of Pakistanis is hidden under a rug. Truth may be the first casualty, but it is not the last. Innocent lives are lost, and ultimately no nation can hope to prevail if it misleads its own people. Peddling conspiracy theories and hiding the reality only breed confusion and doubt which plays into the hands of the anti-state elements. It is a self-defeating strategy in a war where the stakes are too high to accept. This entry was posted in Blogs and tagged afghanistan, Badaber, conspiracy theories, india, karachi, media by Mukhtar Ahmed. Bookmark the permalink.